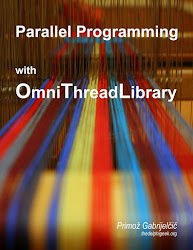 The OtlParallel unit in OmniThreadLibrary offers some high-level solutions that allow you to easily run some kinds of processes in parallel. Up to now it supported self-contained background calculations (Parallel.Future), independent parallel processes (Parallel.Join) and loop calculations where the background task is stateless (i.e. it only depends on the input – the loop value – and not on calculations done on other inputs – loop values; Parallel.ForEach). But lots of time processes don’t fall into any of those categories. Mason Wheeler recently suggested adding support for multistage processes. Over the weekend I’ve implemented it in the OmniThreadLibrary and now this feature is ready for you to start testing. Great thanks to Mason for his suggestion and also for work on the implementation and design of newly introduced Parallel.Pipeline. ITDevCon has finished almost a 24 hours ago but I was simply too tired to write anything about it until now. In short – great event! There was close to 50 participants and sessions were in most cases nicely filled up. Three tracks were running in parallel and sometimes it was quite hard to choose the most interesting session. I was quite sad as I was not able to see any of Alexander Alexeev’s sessions on debugging (the first one overlapped with my own session and in the second case seeing Ray Konopka speaking of user interface design trumped all other options). Besides Ray session which was definitely the best on the ITDevCon (Ray told me to say so ;) ) I have to mention Paweł’s expose on DataSnap and Thierry’s multitouch session which were both very interesting. “No valid license information found for Embarcadero(R) Delphi(R) XE. The funny thing was that my registration count got incremented nevertheless! Of course I only noticed this after five failed installs when the sixth attempt told me that I’ve used my installation bonus and I can install no more Delphis :( Most probably there was some clash between the fresh Delphi XE installation, previous trial version and pre-previous [sorry I can’t tell you about it] version. Of course, I did try to fully remove all remnants of all installations but obviously I missed some important part. At that point I did the right thing and opened a support case. A guy from Embarcadero support responded soon enough with a note that he bumped my registration count and I can retry. Of course I already knew that retrying won’t help so I asked him how to fully clean up my machine. Next day I sent few more mails and finally got a pretty comprehensive clean-up list. Then only problem was that it was completely b0rken (as you’ll see in a second). So I sent a response to that mail, requesting clarification of some items. Nothing happened yesterday either. At last I sent another mail urging the support to please respond to my question and bump my registration count again (as I was already up to 10 registrations – only one of them really successful, and that one was on another machine). Finally I got the reply. Actually, I received a mail stating that my registration count was bumped again. Nothing else. No reply to any of my questions. Nada, zip, zilch. It looks like Embarcadero has tech support that can only do two things. 1. Bump registration count. 2. Send around bad instructions on how to remove remnants of Delphi from your system. Embarcadero people, if you really want Delphi to be successful again, you should educate your tech support. Luckily, I know enough about Delphi to clean my system even without answers to my questions so I was able to finally install XE. Hurrah! I still have to prove that the cleanup list is really really bad, yes? Well, here it is, directly pasted from the support mail. My comments are in italic. I’m trying to uninstall Delphi XE so “Embarcadero RAD Studio XE” would be a better choice. Actually, folder is named \Embarcadero\, not \Codegear\. That would trash the Delphi 2010 install. Only 8.0 subfolder has to be removed. Embarcadero RAD Studio XE, not CodeGear RAD Studio 2010. In item 3, C:\Users was used. Here, C:\Documents and Settings. On every computer, one of those will not be the correct choice. In Delphi XE, those files end in 150, not 120. And on a 64-bit system they live in \Windows\SysWOW64. Dear reader, please tell me – am I overreacting? Or somebody should be fired here for not doing his/her work (and I definitely don’t mean the poor tech support guy I was talking to)? This article was originally written for the Blaise Pascal Magazine and was published in Issue #5. This article was originally written for the Blaise Pascal Magazine and was published in Issue #3.